The saying “use the right tool for the job” applies to hair care, and rightly so! 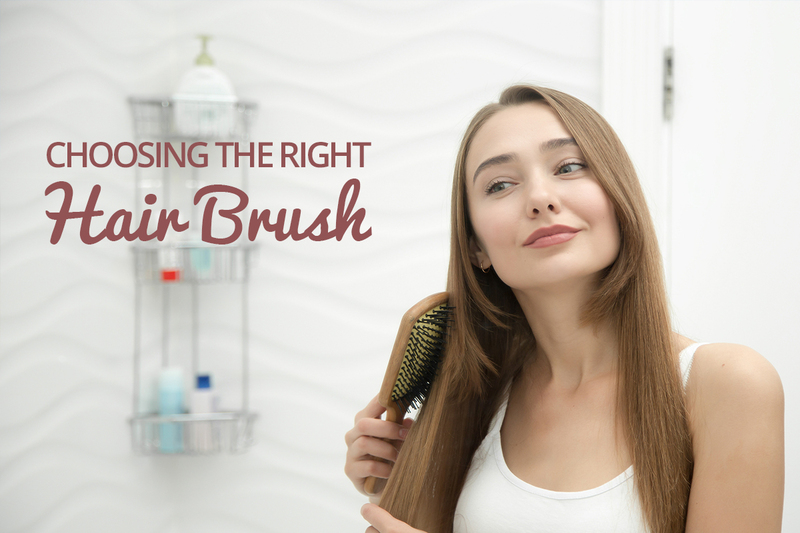 There is a great variety of hair brushes on the market for good reason, as each one has a specific purpose and is suited for different hair types and hair styles. Let’s run through some of the points to consider and explore some of the common brush types you would probably encounter (and need). Before we dive in, here’s a simple rule of thumb: the longer your hair is, the larger the brush you will need. The bristles of hair brushes come in different shapes, sizes and materials. Natural materials such as boar bristles are gentle on hair and scalp, distribute oils well and will not cause static damage. Synthetic materials are not as good for your hair but are good for detangling hair and more heat resistant for styling purposes. The gap between bristles matters too! Closely spaced bristles work well for fine hair (usually natural materials), whereas wider spaced bristles (synthetic materials) are great for detangling thick and curly hair. There are mixed-bristle brushes too which offer the best of both worlds for those with normal to thick hair. This is the go-to brush for most people. Paddle brushes are wide and flat like a paddle, and are best for detangling and massaging the scalp. An excellent choice for long and fairly straight hair, and for styles that are smooth and with less volume. Vent brushes can cut down your blow-drying time significantly by allowing greater air flow around your hair. It’s wide bristles won’t snag on your wet hair either. Round brushes have a barrel-like body with bristles all the way around. If volume, waves and curls are your thing, then this is the styling brush for you. Smaller barrels will give you tighter curls, and larger barrels will get you those luxurious bouncy waves. If you want to straighten out your hair instead, the versatile round brush also works with the help of a blow dryer! These specialty brushes are used to add volume and create up-dos for that retro look or voluminous styles. The pointy handle helps you to section your hair, while the thin brush gently backcombs for extra volume. It works well for styling bangs too! Ionic brushes give off negative ions that help break up water molecules, hence reducing drying time. These ions also have a the effect of reducing frizz and static, making hair healthier and shinier. Note that Ionic brushes are powered by electricity. These are made with actual boar hairs which can distribute oils throughout your hair and impart shine. They also give a gentle massage to the scalp as you brush your hair, improving blood circulation around the scalp. They are also great for straightening, but do note that due to the density of the bristles they can catch on thick hair and are not designed for detangling.